His dominion was going to die until Maverick cut to stay 2nd to only 78 thousandths, but from 3º, Miller, they are more than six tenths. 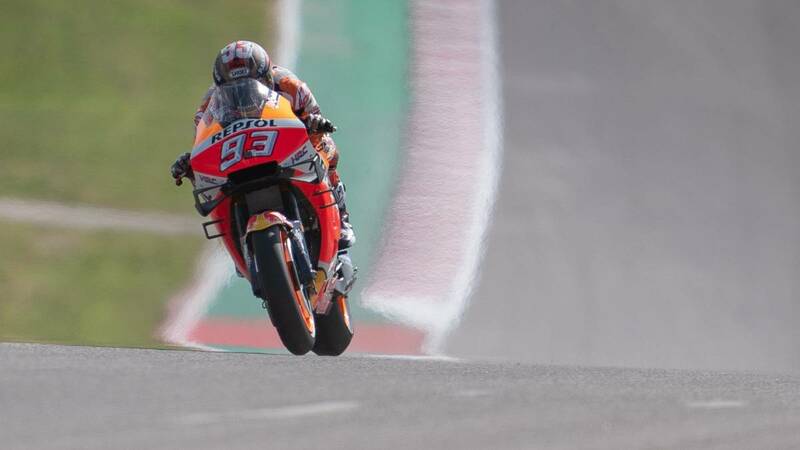 You know, on asphalt with little grip, there is nobody like Márquez. And at the moment, Austin, bumpy and still with the dirty track and with little rubber, is the ideal scenario for the champion to shine again in the head. The time table of FP1 was going to die until Maverick cut his seven tenths of a disadvantage with shame bullfighting, to stay only 78 thousandths of Marc, but the others are beyond six tenths of distance, and that has not yet opted to ride on his Honda the spoiler copied from the Ducati. The first of the pursuers of the leading duo is Miller, which they followed until close the top ten with provisional access to the Q2 were Dovizioso, Rossi, Pol, Quartararo, Crutchlow , Aleix and Iannone. By the way, note that a Dovi was stopped the Ducati in full session and was he himself who took the bike off the track and took it pushing to the service track. It seemed that he wanted someone to tow him to get on his motorcycle to the box, but he could not find who did it and Desmosedici arrived in tow. Returning to Márquez, his initial time was 2: 05.311 which is almost three seconds from record that has in this track with 2: 02.133. That was in 2015, the day of the famous pole after leaving leaning his damaged Honda in the wall, jump it, arrive running to the box after crossing the whole pit lane, to get on his Second bike and flying on the track defying the fall in each braking and each curve. Your partner Lorenzo, however, could only be 18º and was 1.923 of the best record of his teammate in the Repsol Honda. The Mallorcan is one of the four Spaniards who will have to improve in the next sessions to gain direct access to Q2. The others are Mir 14º, Rins 15º and Rabat 21º.